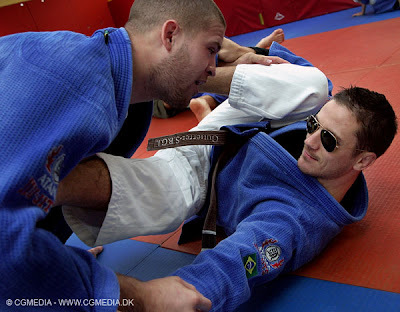 BJJ is much more than the sport you see on the outside. It is much more than just the techniques, the history or the system. Sometimes you have an easy roll and don't experience any of this and other times you go hard or you roll with someone who puts a lot of pressure on you. The most important thing to think of is, that no matter how many emotions and pressures you must go through in that roll, you always come out on the other side. So if you roll and feel really uncomfortable because of some of these things, remember that it is exactly this experience that makes you stronger. It will end and when it does, you come out stronger on the other side. Next time it happens, you handle the pressure a little better and next time again a little more, untill in the end none of these things bother you at all. Nothing can make you panic, no matter under how much pressure you are. And that is a super valuable real-life skill you develop from training in BJJ. If I were to point out one thing, that has had the biggest influence on my training throughout the years, it is without doubt the principle of Aliveness. It is basically just common sense, but I have not come across a better definition and description of just that, than from the Straight Blast Gym. I don't want to copy/paste a long description of Aliveness here, but I want to encourage everyone to read the Aliveness 101 blog and especially the post Why Aliveness. This is a quite posted by Leo Kirby from Florida on the subject of internet discussions. I think it is a great little piece, that everyone can benefit from reading now and then. Just as a reminder on what we are actually doing here. Everyone knows this is just a game...right? 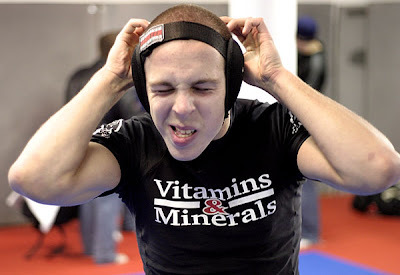 To steal a thought from a friend of mind who posts here occasionally, do you think there are badmitton forums where people get pissed off at each other and debate technique vs. concept, live drills vs. dead patterns? What is it about the Martial Arts that makes all this so serious? Our lack of ego? If I post questions that I have about the way we do things it doesn't mean we do not have a lot of great people all over the world, some of them I have met and some I haven't. It doesn't mean we don't have a few dicks out there either. In short, we are pretty much like everyone else in that regard. Shouldn't upset anyone that i say it though. I'm not sure where that comes from. Maybe in our haste to supress our egos and create a playful enviornment where we can all develope our own games in the spirit of fun we have become a little sensitive to criticism from both inside and out. But in the end we are adults rolling around on the ground with other adults. We are adults sitting behind our little screens typing out thoughts and ideas and opinions. That is all it is. That is all it ever will be. There is really nothing here for anyone to get pissed off at. It is just a giant videogame. This is a post I wrote some time ago about the inquiry method of teaching. It was posted on MMAlibrary on a request from my friend Matt Kirtley. It's quite simple. As an instructor, instead of giving all the answers and teaching in a one-direction manner, you create a framework for your students to explore and teach themselves. I am not an expert in this, but have experimented a bit with it in my gym, and must say it has worked amazingly. People come up with new (good) moves every time and best of all, they really seem to remember things better when they have explored them by themselves. What is really cool about this approach to training is, that I don't act as an instructor in a traditional way. In fact, may of the questions that arise, I don't even have an answer for them, but the people in the gym together can come up with some really good answers, so I learn a lot myself. I don't teach, I just provide a framework for people to learn by themselves. This method naturally brings up the very interesting question: If we can find answers to all the questions together, without having any external information source (e.g. a higher level instructor) - does that mean that we hold all the information inside our (connected?) minds already and just need to "activate" it to "learn"? How cool is this? :) Unfortunately, the game never finished. It was some guys in Germany who made it as a hobby in their sparetime. Yesterday, we had four guys from the gym fighting MMA at the Neoblood and Cage Challenge show here in Copenhagen. Three of the guys were fighting for the first time, all fighting under amateur rules. Charles lost by decision to a much larger opponent after a very close standup fight. 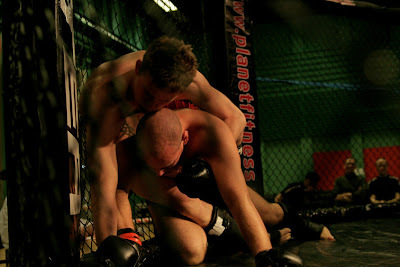 Simon rocked his opponent with strikes from clinch after only 10 seconds and after the tencount, he took the back and won by rear naked choke. Christoffer won a split decision over a tough opponent after showing great takedown and groundwork skills. 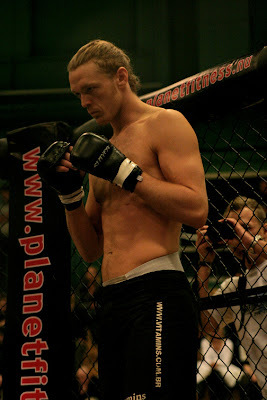 Thomas la Cour was fighting his to day toughest opponent in a professional fight. It was a three round war with the swedish fighter. Thomas won by a close decision after controlling the fight with great takedowns and groundwork. I am so proud of all of these guys! 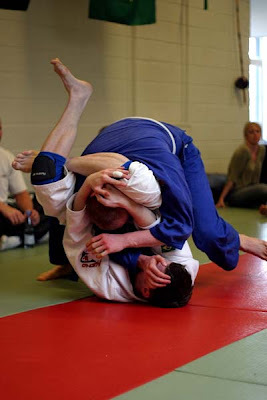 From new students, I often get the question "How long does it take to get good at Brazilian Jiu Jitsu?". It is always a question that requires some time to explain, as there is no answer really. What is "good"? When are you "good"? Consider, that no matter how long you train, there will always be someone who are better and someone who are worse than you at this sport. Let's say you have a goal of reaching the black belt. You train and train for years always with the goal of "getting there". One day, you finally get the belt... and then what? There are still tons of guys out there, who are much better and tons of guys who are much worse. No matter how long you train, no matter how much you - in your mind - measure your own level up against other students, no matter how much you think about how far the other gym in town has come now compared to you, you will never come to a point where you are "done". It is a natural thing for people to gather in groups (/tribes) and then start to gossip about other groups of same interest with whom they have little or no communication with. I think this is seen more in sports, where those groups eventually will meet in competition and measure themselves up against eachother. In real life, some or all of those people in the other group could have been your best friends if you have just met them in another way than as competitors within your own interest group. Does it really matter how "good" they are? Does it really matter how "good" you are? Does it make sense to not be best possible friends with people who share the same interest as you? The point is, that you can never "get there" and then you are "done". So if you always focus on getting to a certain point in your training where you are "good" (measuring yourself against others), then you might forget the most important thing of it all - enjoying the process. My own gym is completely designed with this in mind. Our number one priority has always been to create the best possible environment for enjoying the process of training. We always play nice music in class, hang up pirate flags, play playstation, arrange social activities, and most important of all - we never take training too seriously. Some people might find themselves comfortable in a strict, hierachial, no-music, serious and competition-minded environment, and that is perfectly fine. They just won't come to our place then. We never focus on "being the best", although a side benefit of our process-focus has been, that people are getting really, really good at what they do. Simply because they enjoy coming to the gym every day to hang out and train.